Black Friday, Saturday & Sunday??? Happy Thanksgiving to everyone. 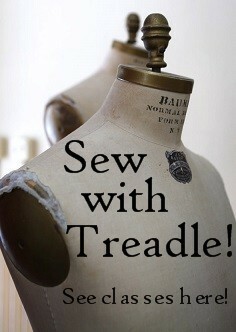 Treadle will be closed on Thanksgiving and all the Treadlettes will be enjoying a day of family, friends and feasting. We will be rested and well fed when we open on Friday, November 28 at the civilized hour of 10:00 a.m. We invite you to join us for savings of 20% on all fabrics and discounts on selected ribbons and trims. FRIDAY, NOVEMBER 28 IS PLAID FRIDAY IN THE TWIN CITIES! Plaid Friday is an alternative shopping experience on November 28. If standing in line at the mall is not your thing, why not have a more pleasant shopping experience at one of the many independent retailers in the Twin Cities? We are sure you will receive superior service and find more unique gifts. As an added bonus, you will be keeping more money in our community! Come in to Treadle wearing plaid next Friday, Saturday or Sunday and we will enter your name in a drawing for a $50 gift certificate! A handmade gift is truly precious and provides joy both for the crafter and the recipient. Scarves, mittens, pillow cases and flannel pajama pants are just a few of the possibilities for gifts for those fortunate souls on your holiday gift list. Stop by and get a start on your holiday sewing and take advantage of the savings. There won't be another sale until after Christmas. Register your card and shop on Small Business Saturday, November 29. Use your American Express card and spend at least $10 at up to three participating businesses and receive a $10 (up to a total of $30) statement credit. Treadle is one of the stores featured on the Small Business Saturday Map so be sure to register online at ShopSmall.com to take advantage of this offer. Registration began Nov 16th and will be capped once a certain threshold of members is reached, so be sure to register as soon as possible. Purchases must be made by the registered card holders in the store on November 29th. We have a sweet new felt crafting book at Treadle, Stitched Safari, just filled with adorable animals to sew! Each project is brought to life with beautiful hand-stitched details. Cats, dogs, giraffes, sheep, goats, elephants, kangaroos, and so many more. It's hard to resist this much cute! Best of all, the book includes a sheet of full-size patterns and detailed sewing directions. So why not start making your own Stitched Safari today? We have some wonderful new corduroys this season. Wales from narrow to medium to ultra wide, in rich, warm colors, these soft, plush corduroys are perfect for winter sewing. Great for pants and jackets, dresses and skirts, you'll love the cozy warmth and casual style.